Update, June 7: Many of you wrote wanting to know more about the music used in the time-lapse video. The song is called "Detectors in the Eyes" and it's by Andrew Shapiro. It took six days for a group of Buddhist monks to create an extravagant sand mandala at Emory University in Atlanta, Georgia. But you can watch the entire process in about two minutes thanks to the time-lapse video above. 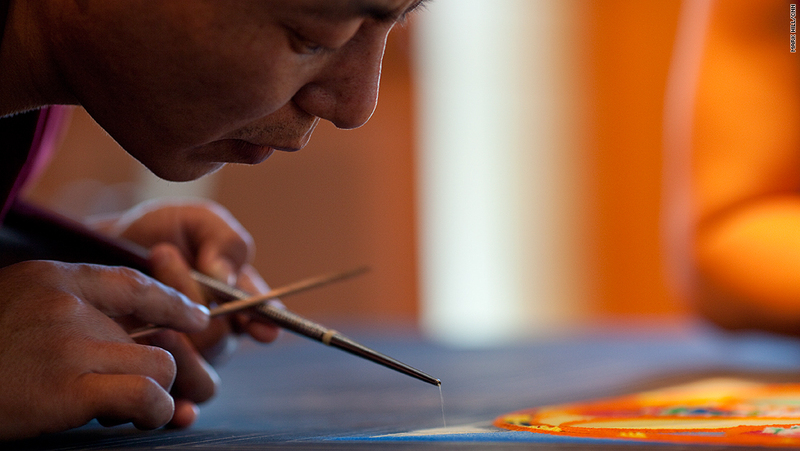 The sacred art was created March 22-27 as part of Emory’s annual “Tibet Week” celebration. The monks were from Drepung Loseling Monastery Inc., a nonprofit organization in Atlanta dedicated to the study and preservation of Tibetan Buddhist traditions. 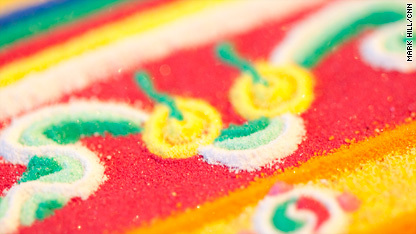 Sand mandalas have been in practice for thousands of years, according to Tsepak Rigzin, assistant program director for Drepung Loseling and an adjunct Tibetan language instructor at Emory. Monks use a grated metal rod and a traditional metal funnel called a chak-pur to carefully place millions of grains of colored sand on a table. “It has to be very exact and very precise,” Rigzin said. There are hundreds of colorful mandala designs to choose from, Rigzin said, but they all share a basic format of geometric shapes and spiritual symbols. The ritual starts with the monks blessing the site of the soon-to-be mandala. 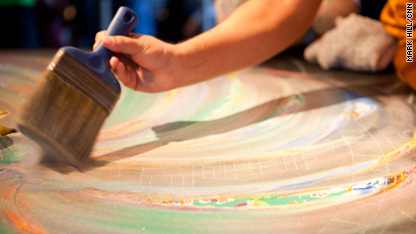 They then take several hours to draw an outline of the particular mandala they are about to build – in Emory’s case, the mandala of Avalokiteshvara, or the Buddha of compassion. Once the outline is in place, the tedious work of laying the sand begins. “I was really awestruck by their level of concentration,” said Mark Hill, the CNN photographer who captured the time-lapse footage at Emory's Michael C. Carlos Museum. Hill set up two cameras in the room. One was an overhead camera that didn’t move during the six days; the other was moved every morning to get a different angle. Both ran continuously, shooting one frame every 30 seconds. When the last grain of sand was set, the monks didn’t spend time admiring their handiwork. Within about an hour, the elaborate art they had spent days crafting was carefully swept away during a ritualistic ceremony. This is normal practice, Rigzin said; it is done to symbolize the impermanence of life. The monks passed out half of the sand to the audience as blessings for health and healing. The rest was poured into a nearby river, Rigzin said, as a gift to Mother Earth. Emory will be having another “Tibet Week” of sorts when the Dalai Lama visits the campus October 17-19. The exiled leader of Tibetan Buddhists has visited the school several times in the past two decades, and he was the commencement speaker there in 1998. That year, His Holiness also helped form the Emory-Tibet Partnership, which includes various exchange programs between Emory and Tibetan institutions of higher learning. « Previous entryMy Take: Can mixing monks and science change the world? The song is called "Priapism" by the band Modern Tumescent. I just downloaded it from iTunes. @Brent, you must be a spirit being. Are you dictating? Anyone one had an ideas why does the master monk keep looking at me for 15seconds with a strange face. I am buddhist but I hardly dont get it. Can someone please explain. I know that I have some light behind me. But he always looking at me. But he didnt even touch me when I met him He walked by me and nothing happens. But he touch other people why not me? Incidentally, they spend years in cloistered monasteries along with other monks learning to do this and creating other artforms so that they can help support themselves and the poor. Many of them do the mandalas in these monasteries, where they are never seen by others from outside of the cloister. maybe the monks' time could be better used. there is a lot of need in the world, and creating something beautiful so that they can then watch it immediately being destroyed might keep their ego small... IF crowds weren't watching them, and they weren't specially trained and didn't travel from city to city and appear on the internet. if they want to sample the meaninglessness of life, they should do this in some cloistered monastery where no one would ever see it or them. art and love should be hidden not shared? so narrow minded of you tmara. So it's destroyed to symbolise the impermance of life; or it's utter fultility? What is the point of creation if the intent is to destroy!!! In the Eastern traditions you can only create unless something is destroyed, thus the belief in a cyclical universe. Someone else mentioned that attachment to the physical is what causes suffering and rebirth. They create these mandalas not only for the beauty, but also for the work that's put into it. The finished project is only as great as the care and work put into it. For that (all forms) which is created, the destruction is certain just like birth eventually but surely ends in death. This applies to all forms that are created. One can witness this – a form is created, stays for a while and destroyed; Just like our earth was born about 4 billion years ago and will eventually be destroyed in another few billion years as per science. While we can't say the form is un-real, but it doesn't last forever and hence its impermanent. What is behind this creation and destruction? Because it's subtle its not immediately perceivable but there is a method by which this can be perceived and eastern traditions have made science out of it and have perfected it for thousands of years! They are not enamored by the forms but very much interested in the source behind all that’s manifested. It's beautiful, yes, but honestly, what struck me was that these monks have far too much time on their hands. Spend all that time to make something and then destroy it? The only people that can do that are those with large trust funds, and religious fanatics.Both contribute about the same to society (although the trust fund kids at least pay taxes). They have time because they are not engaged in the pursuit of the material and are content with little or no belongings. When you're not worrying about paying your mortgage, that new flatscreen LCD, that BMW, and other such materialistic endeavors, I'm sure you'll have plenty more time for spiritual endeavors such as this. maybe they don't have the internet, hence they aren't wasting any time that way. Maybe a contemplative life is very simple, without lots of material possessions to whisk them off to work to pay for the things they own. Maybe the pace of their lifestyle is slow enough to allow for such things to come about.
. The song is called "Detectors in the Eyes" and it's by Andrew Shapiro. @Race: you are a god amongst men. Thank you so much! I've been checking this forum daily in the hope someone would come up with the answer. You, sir, have done your good deed for the day. Really, thank you. When I posted this on my Facebook wall I had absolutely no idea that it would spark this kind of debate, and touch so many in such a display of profound thoughts and feelings. I don't understand the bigotry and negativity – I was simply awed. Everything about the post brings deep feelings of peace, love, and spirituality to me.